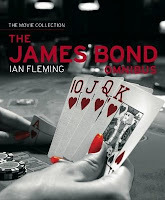 Cover art for Titan's books James Bond Omnibus: The Movie Collection has been revealed on Amazon.com. Due for release in September, this volume brings together eleven strip adventures that have previously been featured in earlier Titan collections: Casino Royale, Live and Let Die, Moonraker, Diamonds are Forever, From Russia With Love, Dr. No, Goldfinger, Risico, From a View to a Kill, For Your Eyes Only and Thunderball. The book also includes an introduction by Sir Roger Moore. Considering these are adaptations of the original Ian Fleming novels and have nothing to do with the film versions, calling this volume "The Movie Collection" seems odd (and potentially confusing). But could this be further evidence of some kind of new business arrangement between IFP and Danjaq? UPDATE: Word is some of the details on the Amazon listing are inaccurate and will be revised.